Strike a pose in front of the Greetings from Houston mural, located on the east side of Gelazzi in the Heights, and send a shot to your out-of-town friends and family. Created by Houston’s prolific muralist and artist Daniel Anguilu, Greetings from Houston sums up the Bayou City in an 1970s style postcard featuring classic local iconography of the time and the ages. 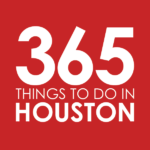 An oil derrick, rocket ship and Heights stamp are joined by a Texas flag-waving cactus, a cattle skull and an old school cassette tape (possibly a mix tape of songs about Houston?). Anguilu successfully tweaked the classic postcard design, including his signature design, an intricate mosiac web of colors, shapes and lines. You can view more of Anguilu’s work on his Facebook page and Flickr photostream. 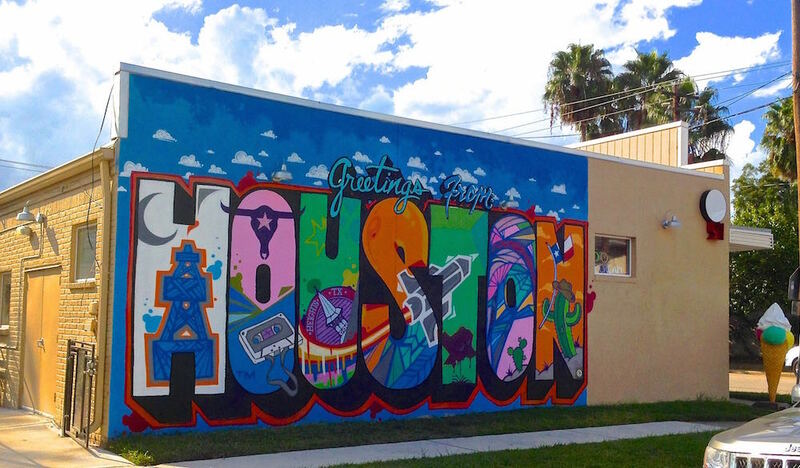 The Greetings from Houston Mural is located on the side of Gelazzi, an Italian gelato shop in the Heights on White Oak. The mural is along the sidewalk on the eastern side of the building (your left hand side when facing the entrance). It’s easy to spot on your left when driving on White Oak towards Height Boulevard. It’s very common to find cars parked alongside the curb in front of the mural. So if you’re hoping for a photo shoot, try to visit in off peak hours. The morning is ideal, when the sun is shining from the east.